The Tate Britain retrospective on Paul Nash (1889-1946), now on in London, reveals an artist of diverse interests and talents. Well known as a painter of expressive landscapes, Nash was involved in a wide range of artistic production during his lifetime, including prints, textiles, glassware, book designs, photography, set designs and designs for domestic interiors. Yet Nash first made his name as a war artist during the First World War and it is as a war artist that he is often best remembered. 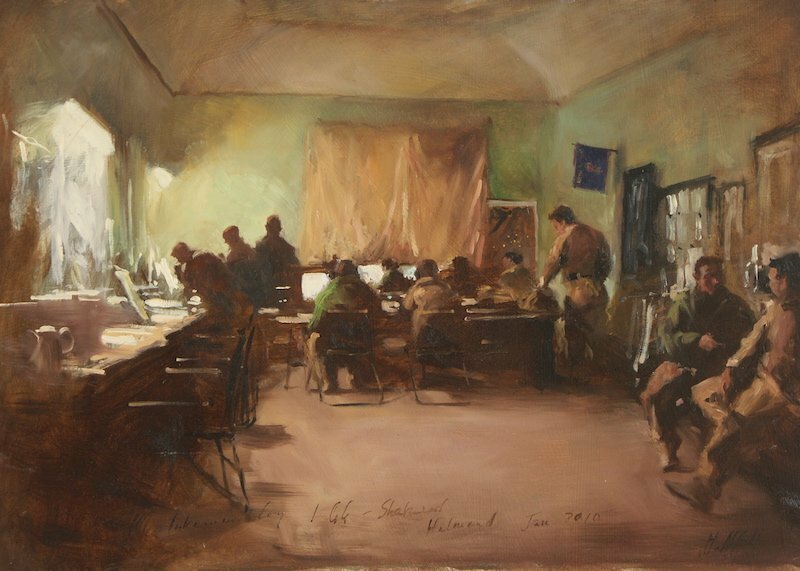 One of only a handful of artists commissioned by the British government during both world wars, he remains among the most influential war artists of all time. Remarkable in its own right, his career also charts the expansion of government support for art during wartime. And it illustrates how the concept of the war artist developed over the course of the 20th century. The “official war artist” didn’t exist when the young art student Paul Nash enlisted in the military at the outbreak of World War I. In 1914 there were only artists, or soldiers, or soldiers who just happened to be artists. Nash began as one of these. Like many men with backgrounds in the arts, he signed up with the Artists Rifles, a territorial regiment based in London. Despite their name, making art was not part the brief for the Artists Rifles. Instead, they served as ordinary soldiers and eventually saw combat in France, fighting and dying along with other troops and suffering a high number of casualties. Thanks to a freak accident, Nash was to have a different fate. In 1917, when stationed on the Western Front, he fell into a trench while sketching, cracked a rib, and was sent home to London. While he was recovering, Nash’s unit took part in the notorious assault on Hill 60 during the Battle of Messines. Most of his former comrades in arms were killed. The fall proved a lucky break for Nash in more ways than one. The British government was at that moment launching the unprecedented scheme of wartime art sponsorship that gave birth to the idea of the official war artist. The Imperial War Museum (IWM) had just been established with a mission to document the war. It was starting to actively collect art and other materials, and to commission its own artists to build its collection. Following a tip from a fellow artist, Nash applied and was hired by the new scheme. He became one of the first government-supported war artists, joining a prestigious group that included luminaries like Wyndham Lewis, John Singer Sargent, Sir Stanley Spencer and Sir William Orpen. The IWM also bought war-related works by other professional artists, male and female, and collected the work of amateurs including serving soldiers. Nash left the front as an ordinary infantryman and returned as an official war artist, an observer in uniform with his own rank, batman and chauffeur. Nash turned this raw material into some of the most powerful works of war art ever made. When drawings such as The Wire and paintings like We Are Making a New World were exhibited in 1918, they shocked the public but at the same time were highly praised. The Wire by Paul Nash was first exhibited in 1918. These works established Nash’s early reputation and laid the groundwork of a new standard for art that unflinchingly showed war’s harsh realities. At the same time, they boosted public awareness of the role of the war artist and set the stage for its next phase during World War II. The inter-war years saw Paul Nash pursue many avenues in his art, including a return to landscape painting and a prolonged Surrealist period. When the Second World War broke out, however, Nash was one of the first artists to receive an official commission. 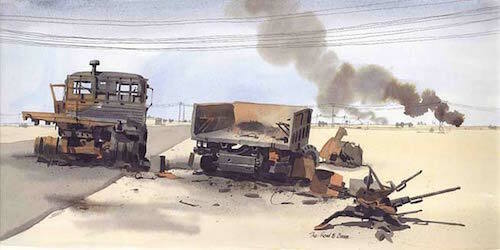 At the age of 51, he found himself once again on the government payroll as a war artist. Despite his seniority, his relationship with his employers didn’t always go smoothly. Initially hired in 1940 by the Air Ministry, he was briefly fired for being too avant garde, then rehired for the duration by the newly-appointed director of the brand new War Artists Advisory Committee (WAAC). His champion, Sir Kenneth Clark, was then director of the National Gallery. As head of the WAAC he would become the driving force behind a huge expansion of government support for art and artists during the Second World War. The numbers testify to the size of Clark’s vision. Under his energetic leadership, the WAAC gave full-time employment to thirty-six male artists and one woman, Evelyn Dunbar, during the war years. It offered short-term contracts to a hundred more artists and bought works by a further 264 professionals and amateurs. By the end of the war, the WAAC had commissioned over 400 artists in total, including John Piper, Graham Sutherland, and Henry Moore on the home front, and Anthony Gross, Edward Ardizzone, Mary Kessell and Dame Laura Knight overseas. It had purchased some 5570 works of art, the majority of which later found their way into the IWM’s collections. The WAAC was dissolved at the end of the war in 1945. 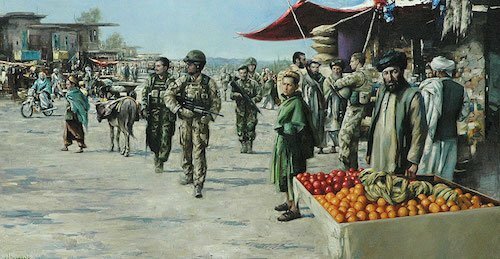 Its remit for supporting war art passed to The Imperial War Museum, which today continues to collect and to commission official war artists. Recent years have seen IWM commissions going to prominent British artists including Turner Prize winner Steve McQueen, Roderick Buchanan and Willie Dougherty. The team of Langlands and Bell created the video work, The House of Osama Bin Laden, as a commission for the IWM in 2003. Today’s official war artists differ from Nash and his contemporaries in a number of ways. There are relatively few of them, for one thing. Despite Britain’s involvement in a string of conflicts in recent decades—including the Falklands, the First Gulf War, Bosnia, and Afghanistan—the IWM commissioning program is tiny compared to Clark’s expansive wartime operation. Another difference is their relationship with the military. Nash and most of his war artist colleagues spent time in uniform and many were given officers’ ranks as part of their war artist status. War artists saw combat in both world wars. During World War II, three of them, including Eric Ravilious, died in the field. By contrast, today’s official war artists are mostly civilians with no soldiering experience. They typically maintain their distance from the military. With rare exceptions, such as photographer Mark Neville, who worked for two months alongside British soldiers in Helmand, they often spend little time—just a few days in some cases—in war zones. Paul Nash would have recognized the value of these civilian war artists and the perspective they bring. He worked as a civilian himself during World War II, when age and ill health kept him in Britain. From his Oxford studio he produced some of the most haunting images of the war including the extraordinary Battle for Germany and what is probably his most famous work of war art, Totes Meer. Paul Nash painted The Battle for Germany while working as a war artist in his Oxford studio. Yet the direct experience of making art on the front line was formative for Nash—and for Britain’s tradition of war art. For this reason, Nash might find more in common with a different kind of war artist working today. 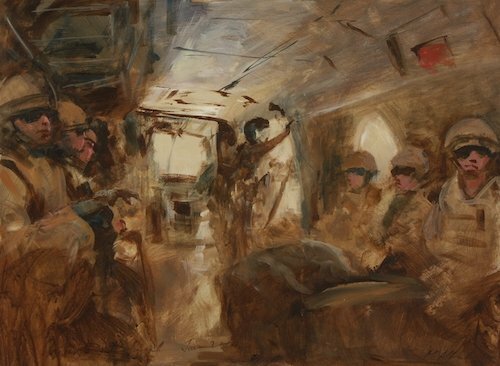 These are artists commissioned directly by the military to document particular campaigns. Like Nash, they travel into combat zones and spend significant amounts of time in the field, living and working beside soldiers, sometimes on the front line. Their brief, similar to Nash’s, is to make a record of what they see and, often, to produce drawings and paintings for regimental collections. The Afghan Conflict saw a crop of British talent working with the military in this way. 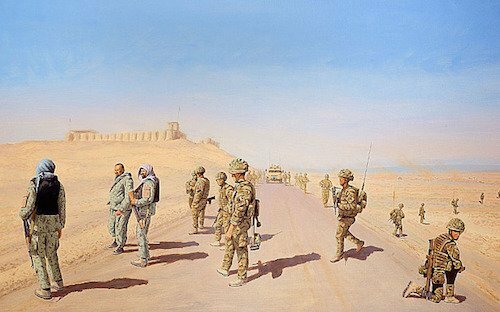 Established artists like Michael Alford, Matt Cook, James Hart Dyke, Arabella Dorman, Marcus Hodge and Douglas Farthing, have all spent time embedded with the military in combat zones. Some, like Alford and Farthing, a former serving soldier, returned several times. 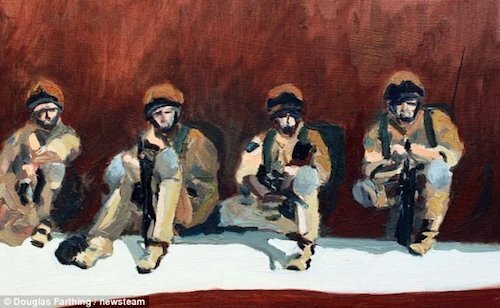 One, Graeme Lothian, was wounded by a Taliban bullet during his stint as a war artist. 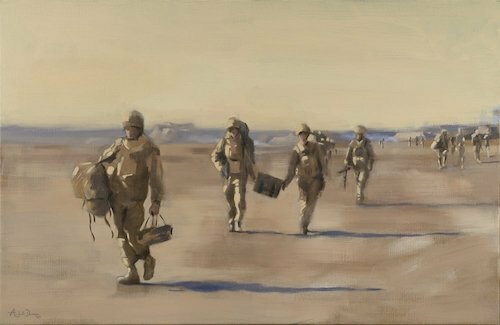 Like Nash, these war artists witness conflict first-hand and collect primary material in the field. While not official in the sense Nash was, they’ve gone on to produce some of the best documentary work on recent wars, and certainly some of the most accessible. 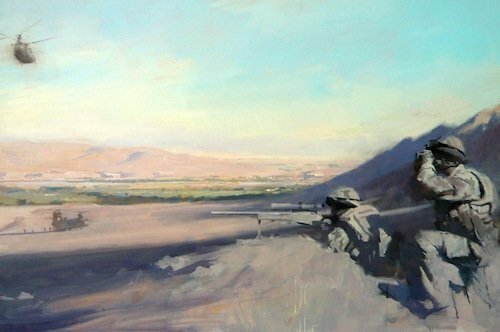 Many have used their experiences in a wider creative context, creating significant bodies of work on the theme of modern warfare. Their output has been purchased by national collections including the IWM and the National Army Museum. 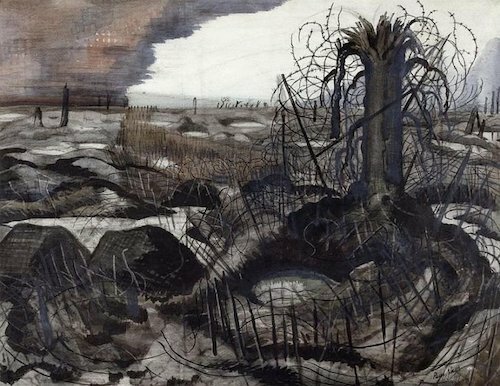 These contemporary war artists—and all war artists of the future—owe a debt to Paul Nash. A reluctant soldier, he became an impassioned advocate for truth-telling about war through art. In doing so, he gave us some of the most striking images we have of warfare and its consequences, especially its impact on the natural world. Nash’s story also shows us what government subsidy for the arts can achieve even in a country stretched to the breaking point by war. It is perhaps ironic that his most famous works of war art, which are so clearly not pro-war, were in fact paid for out of the budgets of the War Propaganda Bureau and the Ministry of Information, who ran the war art schemes during the two wars. But this is the case. Nash owed his career and probably his life to the government programs that subsidized his art. So did hundreds of other artists who were able to keep working because of them, especially during World War II. This was no accident: Kenneth Clark had witnessed the devastating effect of the First World War on a whole generation of young artists. Saving artists’ lives, and fostering their careers beyond the war, were two of his aims at the WAAC. Through subsidy he hoped to keep British culture alive, no matter what the outcome of the conflict might be. 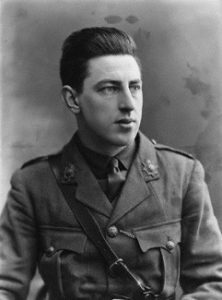 Paul Nash died fairly young, just after the war’s end in 1946. Yet his wartime works continue to have a particular impact on our ideas about war art and war artists. Nash, the soldier-artist, helped define our image of the war artist as witness. 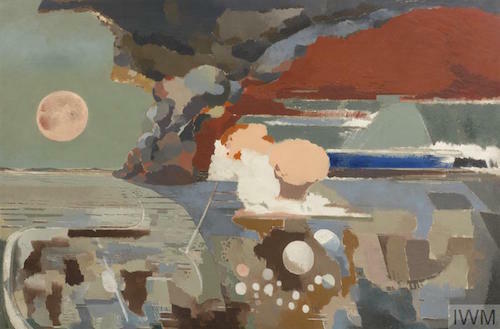 The works he left us have continue to shape contemporary views of what war art can, and should, be. More information about the Paul Nash Retrospective at the Tate Britain London. Times. Ticketing.